Horse dander, dandruff, and dry skin actually occur when horses lack beneficial omega 3 fatty acids. Flax is packed with natural Omega 3 for horses, to help restore moisture to the surface of the body, which promotes healthy skin and a shiny, soft coat. And that’s not even all of the health benefits Omega 3s offer when feeding flax to horses. These essential fatty acids are also anti-inflammatory, so giving a scoop of flax after a workout will address more than their dry skin. Flax also contains fiber (which everyone can appreciate for bowel health) and protein, that help the body make proteins needed for muscle, hair and hoof. Ground Flax Seed is perishable. Store this product in a cool, dry place away from insects and rodents. Seal tightly when not in use. 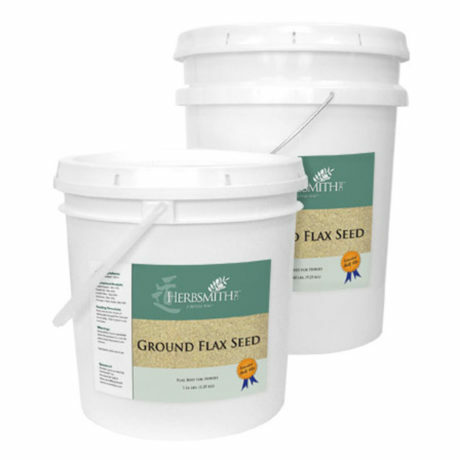 Feed one to two scoops of Herbsmith Ground Flax Seed per horse daily. Still Have Questions About Ground Flax Seed?